One of my favorite book series is Stephen King's The Dark Tower. It isn't a perfect series. There are innumerable continuity errors and the last three books were clearly rushed. But they're weird in the most wonderful way, and I love every one of the main characters: Roland, Eddie, Susannah, Jake, (and Oy). Thus, the movie adaptation of The Dark Tower had a lot to live up to. It had great source material, a built-in excuse for why things weren't the same as the book, and excellent casting. Reviews had me worried and lowered my expectations. I think that might've helped the movie. It is a nice breezy length, explaining the basics and getting down to business. In this turn of the wheel, Jake (Tom Taylor) is a troubled young man in modern New York who dreams of kids being used to power a machine attacking the Dark Tower. He follows the clues in his dreams to find a gate to Mid-World, where he finds the gunslinger Roland (Idris Elba). 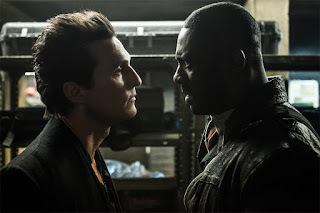 Roland is the man he needs to fight the Man in Black (Matthew McConaughey); however, Roland is more interested in revenge than protecting the Dark Tower. McConaughey is a delight as the menacing Man in Black and I thought he captured the spirit of the character well. I think Elba is brilliant casting for Roland, but he felt somewhat lacking in the intensity needed. At the same time, he is playing a less obsessive (in some ways) version of Roland. Taylor holds his own against them quite well and honestly impressed me. Jake's character changes the most, but I was sold on this kid as haunted and driven. I only wish we'd gotten more of him learning to be a gunslinger, especially as he ends up a 'damsel' in distress several times. The Dark Tower is a fun fantasy movie with a few cool action scenes and a touching father-son relationship that develops through the course of the film. The movie misses some obvious chances for references to the book, but manages to weave in events from the first three books as well as a wealth of Easter Eggs. It's not everything I hoped and dreamed for, but neither is it a disaster. It's a start. If they do continue it with a TV series, I can't wait to see Eddie and Susannah and I hope this Roland and Jake return.